In the cutting horse world, the name Buster Welch rings synonymous with ability, ambition, personality, and – most of all – success. In the cutting horse world, the name Buster Welch rings synonymous with ability, ambition, personality, and – most of all- success. For Buster ranks right at the top in a field that is crowded with talent. This personable Texan has parlayed his talents with cutting horses into fame and a good living. Just mention his name anywhere among western horsemen and it is instantly recognized as Buster has trained not just one, but several cutting horses that have made it to the top in nationwide competition. The most famous has been Marion’s Girl, the great little mare owned by Marion Flynt of Midland, Texas. 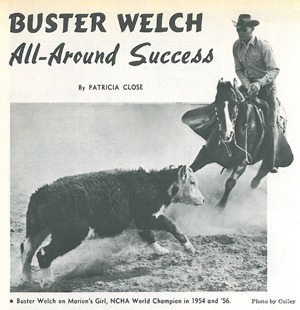 Under the training and riding of Buster, Marion’s Girl won the NCHA World Championship in 1954, and after a year of rest during ’55, came back to win it again in 1956. During her career, this mare won over $35,000, at a time when purses were not as high as they are now. Another horse that Buster developed and trained, Chickasha Mike, was the 1956 NCHA Reserve World Champion. In 1960 Buster trained and rode Jessie Jack to the NCHA World Champion Stallion title. When the National Cutting Horse Association started its futurities for three-year-olds, Buster won the first two with Money’s Glo in 1962 and Chickasha Glo in ‘63; and placed fifth on Glo Doc in 1964. The latter four horses were owned by C.E. Boyd, Jr., now of Houston, Texas. This past November Buster took Money’s Glo for new owner Repps Guitar to the NCHA Finals in Las Vegas. He won the first go-round, tied for third in the second, and tied for fourth in the average. Some 77 horses competed in the Finals. Immediately after getting home, this ambitious trainer held his first cutting horse school which attracted “students” from as far away as Vermont and California, and even one from Australia! Judging by the interest in these schools they should be another successful Buster Welch enterprise. Today, Buster’s home is the Ranch, just outside of Roscoe, Texas. He also leases the former C.E. Boyd, Jr. Ranch near Sweetwater and the former L.S. Howard Ranch southeast of Roscoe. He operates and manages these three ranches in addition to training up to 15 horses, showing one or two on the circuit, and holding his cutting horse schools. Things are going well for Buster now, but like so many self-made successes, he started from scratch. When at the ripe young age of 14 and attending a Midland school, he figured he’d had enough formal schooling as school was too confining for his likes – since he was ranch-raised and used to open spaces. So ·he turned in his textbooks (and now says, “That was a mistake! “). But he was lucky enough to get a job breaking colts on the ranches of two knowledgeable cattle and horsemen, Leonard and Foy Proctor of Midland.